On Thursday, January 17th, Northeast Ohio experienced a smaller winter weather system (system is a scientific term for an intense storm). Although it still caused plenty of ice and a couple of inches of snow, those storms were just teasers for what will come this weekend. Around January 1st, the polar vertex was howling around the Arctic. Later, it divided up into three smaller vortices, one of them making its way down East to Cleveland. 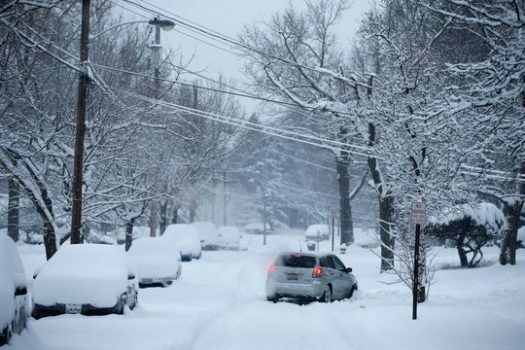 This big storm was named Winter Storm Harper; it is expected to hit Ohio on Saturday morning. At around 7 a.m. on Saturday morning, the snow will begin to fall. It will begin moderately, and ramp up throughout the rest of the day. The National Weather Service advises that people should stay inside Saturday through Sunday morning, because travel conditions will be dangerous. The National Weather Service also advises to bring supplies in case of a weather-related emergency. Winter Storm Harper is expected to bring Cleveland 10 to 12 inches of snow. If Cleveland gets 11 inches, that will be the 7th heaviest snowfall ever recorded in Cleveland. This storm will not only bring a large amount of snow itself; it will bring howling, Arctic air to Lake Erie. This freezing air will most likely cause Lake Erie to freeze over, meaning lake-effect snow. So even after this massive system has gone through, Cleveland could still be hit with lake-effect snow for the rest of this long weekend.